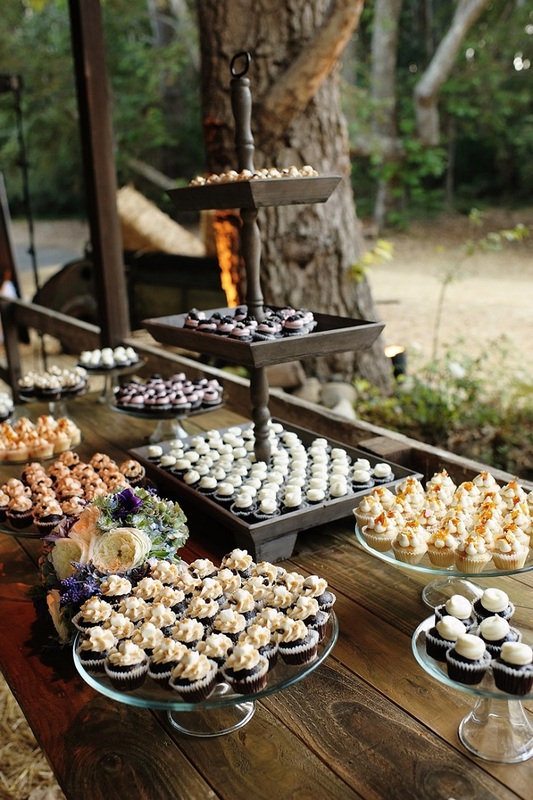 The food bars, also known as food stations, became a very popular wedding trend. There are plenty of ideas on how to decorate your own and what to serve – you will be surprised at the possibilities you have! In this article we are showing you ten ideas on food bar – some are cool and colorful such as the candy food bar, while others are more elegant, such as the champagne&macarons food bar. Check them out yourself – who knows, maybe you’ll find exactly the food bar from your dreams! French fries are one of the most beloved and popular fast foods among many people, so serving them on your big day is going to be a hell of a choice. 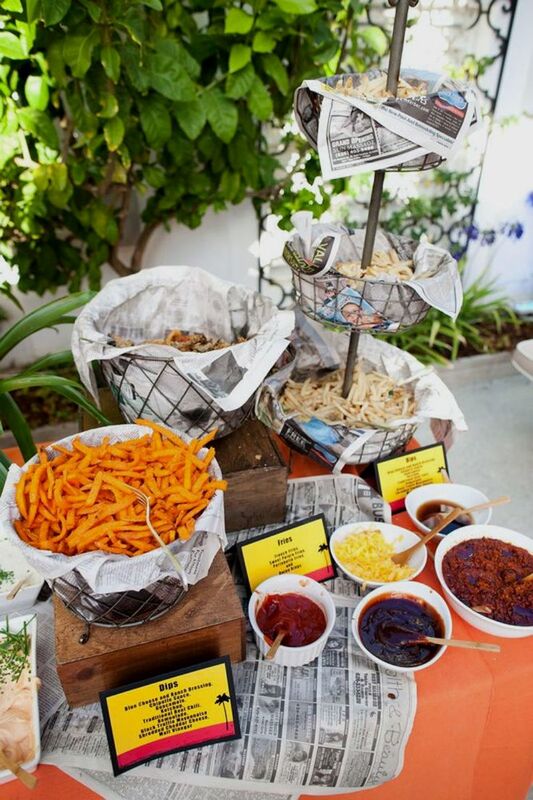 We’re pretty sure that the majority of your guests will be delighted to have some french fries and dipping sauces. You have plenty of choice when it comes to this, from bbq sauces to spicy mustard dips, so make sure to serve as many as possible. Is there anyone who’s not a fan of a good, crunchy cookie? Cookies come in many varieties, so you will have a lot of choice if you go for this option. Sugar, chocolate, double chocolate, cinnamon cookies, there are so many of them that you can serve. 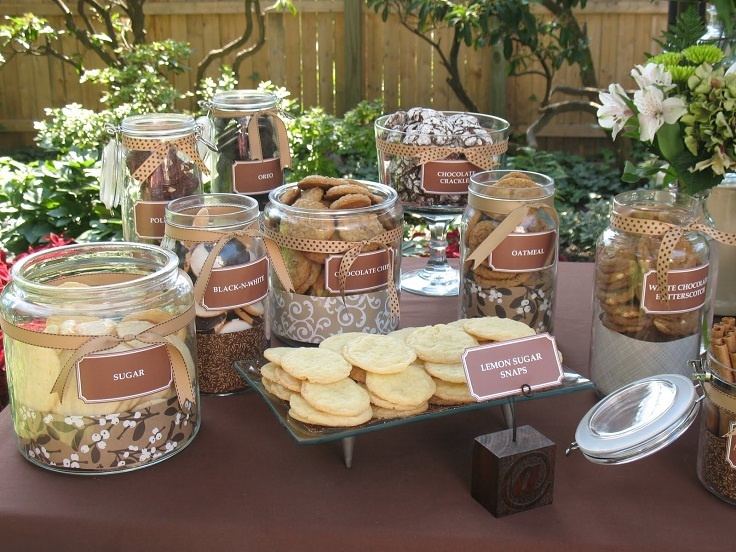 To make your food bar pretties, you can keep the cookies in big jars with a ribbon and a tag with the type of the cookie in it. Plus, you can serve them with milk! 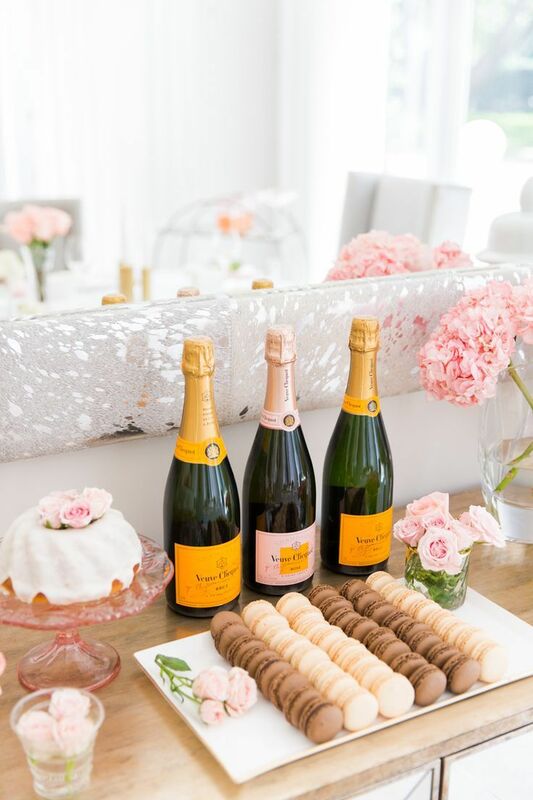 If you are looking for an elegant and fancy food bar station for your wedding day, one of the best ways to achieve that is by serving the French style with champagne and macarons. You can make it even more elegant if you decide to serve macarons in few pastel colors that will totally match the bottles of the champagne. One reason plus on having a potato food bar is because it is gluten – free. This is important if you have guests who are gluten intolerant. 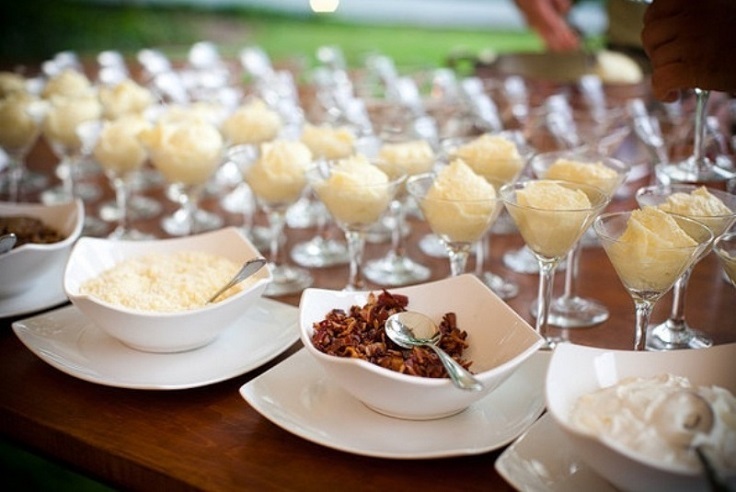 It may sound to you as a boring idea to have a mashed potato bar, but with the right add-on ingredients you can totally upgrade the whole bar. You can serve chopped bacon, sour cream, cheese, olives, spices, whatever you feel like serving! 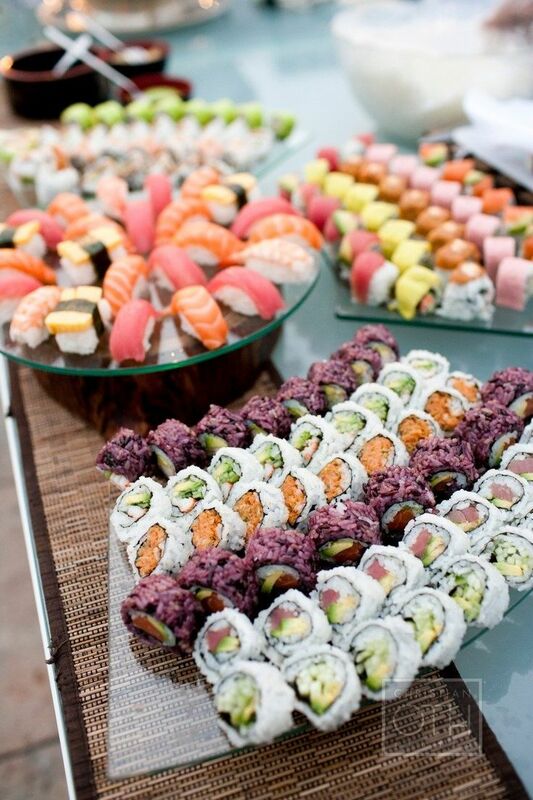 Having a sushi food bar at your wedding will be a dream come true for those who love sushi. Maki, uramaki, sashimi, nigiri, are just three types of sushi rolls that you can serve, although the choice is bigger. However, considering the fact that not everyone is a fan of this part of the Japanese cuisine, you might want to consider serving something not that raw as well! If you’re having your wedding day near Christmas and New Years, you can serve hot chocolate on your food bar. Especially if it’s cold outside, everyone would like to warm up a little bit and the fact that it’s chocolate we’re talking about, it makes your food bar even more attractive. 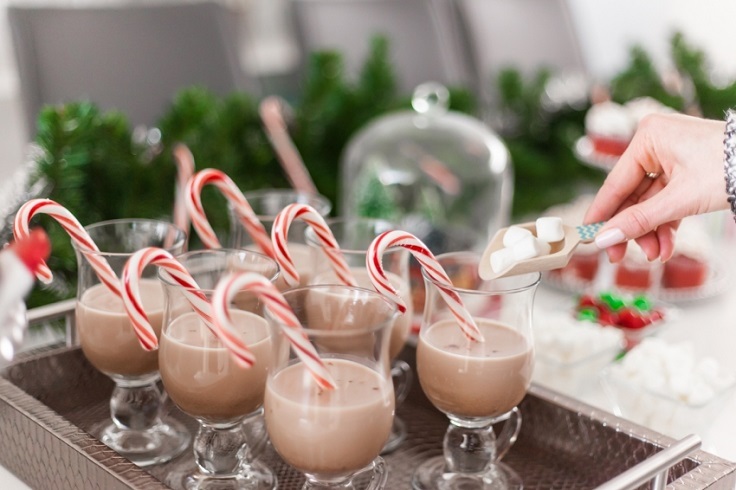 You can serve the hot chocolate with candy canes. 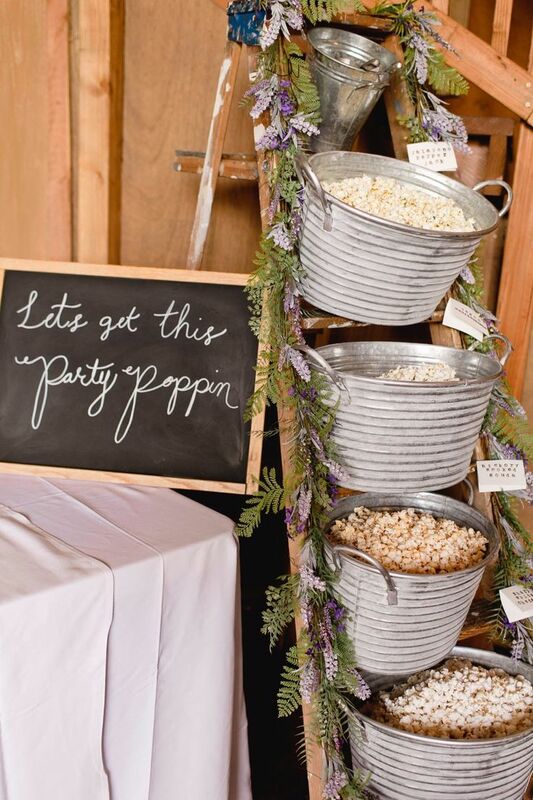 First you may get the impression that popcorn is too ordinary to be served on a wedding food bar. But, if you serve it the right way, it can be the best thing ever. Just take a look at the picture – serving the popcorn in big buckets on a ladder decorated with flowers is just so rustic and it looks amazing. Just can use this idea and serve flavored popcorn, from chocolate – drizzled to caramel. Cupcakes are a popular choice when it comes to wedding food bars, however they’re such a classic – it doesn’t matter that they can be so often served at weddings because cupcakes look amazing and taste heavenly. Make sure to have different types of cupcakes and frosting – it can be really colorful, eye-catching and oh-so delicious! Speaking of colorful, one sure way to achieve that is to serve candy in colors, shape and size. 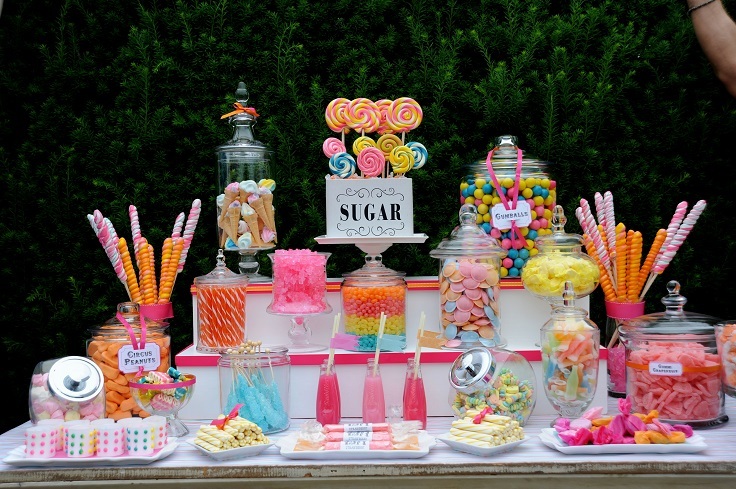 Make it look like a real candy land and trust us – there is no way that your guests won’t admire your food bar. Everyone would like to have a piece, especially the kids. This is really a creative and delicious food bar! The antipasti has its origins in Italy, where it is served as a first course. It isn’t just one food, but more mixed – cheese, charcuterie, breads, dips and herbs. Also, there is a mix between materials – wood, glass, marble. 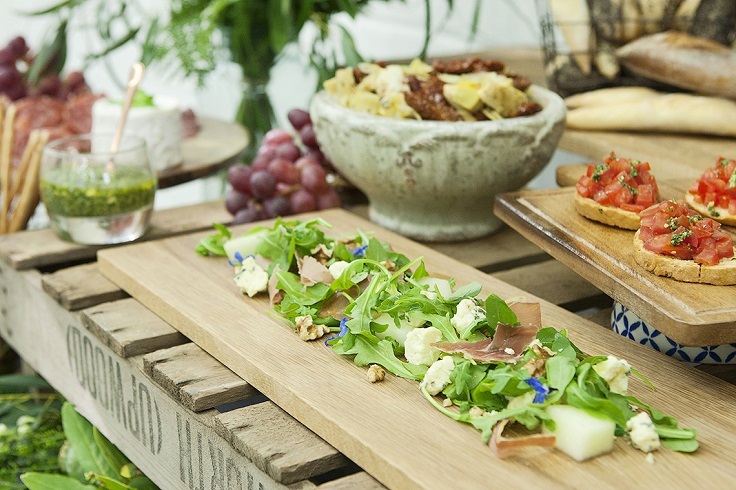 This is an ideal way to add an Italian charm to your food bar!